The Ki-61-I otsu Hien is a Rank II Japanese fighter with a battle rating of 2.3 (AB), 3.0 (RB), and 3.3 (SB). It has been in the game since the start of the Open Beta Test prior to Update 1.29. Unlike its more maneuverable and agile counterpart, the A6M Reisen, the Ki-61 is more of what one would call an "energy fighter". Compared to the "Zero" it is faster, has a higher climb rate, and handles better at higher speeds. Armed with four 12.7 mm Ho-103 machine guns and plenty of ammunition, the Ki-61-Ib is a more than capable fighter. As a continuation of the Japanese army tree, the Ki-61 is the successor of the earlier Ki-43 Hayabusa. The Hien is faster, has a higher rate of climb, and features a better armament. Utilize these three aspects when facing enemy aircraft. 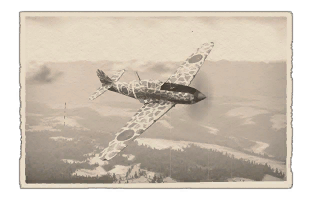 One of the major advantages the Ki-61-Ib has is its climb rate. The stat card may be misleading, but this plane can reach altitudes no enemies will be close to (unless of course, the enemy is another Hien). This allows the Hien to choose when and where it wants to fight. Instead of simply "turning and burning" the Ki-61 is very good at energy fighting, or "boom and zoom". Once at a high altitude the Hien pilot may choose to dive lower to attack an enemy. If the enemy is not destroyed on the first pass, it is recommended to climb sharply and gain altitude. By doing this, the Hien sets itself up for another attack while not being in range of the enemy's guns. 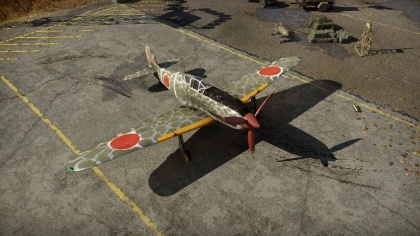 The Ki-61-I otsu looks akin to the Bf 109 in construction, with its inline engine and armament locations in the nose and wings. The Ki-61-Ib utilized four 12.7 mm Ho-103 Japanese machine guns. Generally they are unreliable and it often takes hundreds of rounds to destroy an enemy plane. This is due to the lack of primer in the rounds themselves. 12.7 mm rounds fired by the M2 Browning may seem to do more damage because they have more primer which dictates how fast the round will exit the barrel. Due to this, it is necessary to get up close to enemies. Aim for the engine, pilot, or fuel tanks if the location is known. Remember to lead with these machine guns, as the rounds are not high velocity. The Hien is best utilized as a multi-purpose fighter. Although proficient at energy fighting, the Ki-61 is also generally good at standard maneuvers. It may lose turn fights with some enemy aircraft like the Spitfire Mk Vb/trop, but nonetheless it can still be used in multiple roles. The Hien is your standard "jack of all trades". It's not incredibly good at anything it does but it is even across the board. This allows the Hien pilot to choose what role he or she wants to play in the battle. One could play the reserved, high flying energy fighter, or the aggressive low flying dog-fighter. The Ki-61 allows these choices. Its armament is generally flexible, as it is able to equip multiple kinds of bombs. However, its weapons are considered by many to be unreliable and unwieldy. With accuracy and shot placement, the large ammunition pool can work to your advantage. The best choice of bomb load out is the 250 kg bombs due to the lack of precision needed. A pilot can miss a direct hit on a pillbox and still destroy it. If caught in a sticky situation, the Hien pilot may choose to do several things. Depending on your altitude, executing a rolling scissors or an overshoot may be a valid tactic. try to make the enemy pilot feel pressured to disengage. Depending on the enemy's aircraft, use your speed to your advantage and try to get away. The most sure tactic would be communicating with teammates to ensure your assailant's death. Once tailed, the Hien pilot can "set up" an enemy by nosing up about 70 degrees so the entirety of the enemy plane is shown. At this stage, ideally your teammate is arriving to save the day. In realistic battles, if your team is made up of A6Ms it may also be beneficial to fly to them and start turn fighting. The Ki-61 was first put into service in with a special training unit, the 23rd Chutai, and entered combat for first time in early 1943, during the New Guinea campaign. The Hiens were sent into a difficult theater where jungles and adverse weather conditions coupled with a lack of spare parts quickly made short work of the Japanese fighters. Nonetheless, the Hien proved to be a worthy adversary and it even outclassed the P-40. Towards the end of the war, Ki-61s were relied upon heavily to defend the Japanese mainland from B-29 attacks. Some pilots used ramming attacks to down the Superfortresses. Soon, entire "special attack squadrons" were formed for the sole purpose of ramming B-29s. A lightweight multipurpose fighter plane, the Ki-61 Hien (“Swallow”) was well-armed and well-armored. From the very beginning, the makers of the Ki-61 concerned themselves with protecting the fuel tanks and the pilot. The light multipurpose fighter was an effective answer to “hit-and-run” fighters, thanks to its survivability and high diving speed. The Ki-61 had a Kawasaki Ha-40 liquid-cooled inverted V12 engine, a licensed copy of the DB 601A, capable of 1175 hp. A prototype was ready in 1941, and by the next year the first production models were manufactured and the Ki-61-I entered service. The Ki-61-I-Ko was equipped with two wing-mounted 7.7 mm machine guns and two fuselage-mounted synchronous 12.7 mm machine guns. The Ki-61-I-Otsu’s four machine guns were all large-caliber. All in all, 1380 Ki-61-I aircraft were manufactured. This page was last edited on 10 March 2019, at 19:00.